T shirts bought from APS will ensure you get plenty of attention! dont missthe opportunity to embarras your stag or hen. 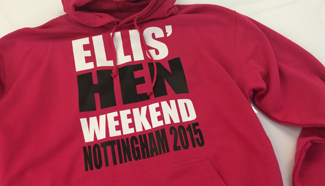 If you've got an idea for your hen party t shirts we can make it happen giving you a great time wearing it and wonderful souvenirs to keep afterwards. You can visit our showroom in Northampton to see the wide selection of products we have on display, or contact us by phone on 01604 710050, email or post to discuss your order.